*Panel shown finished with Armstrong/Clark Cedar Semi Transparent Conditioning Oil Stain. Green Construction Heart Rough has been used for fencing in San Francisco for well over a century, and it remains the most popular choice today. It is an unseasoned (green) all red heartwood grade that is naturally decay resistant. The California Redwood Association (CRA) describes Construction Heart as “containing knots of limited size” and recommends it “for work on or near the ground for posts, rails, kickboards and fence boards”. 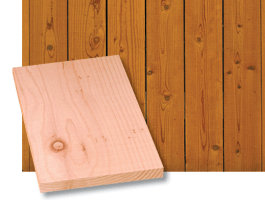 Our boards are cut thick at between 13/16″ and 7/8″ thick with a bright resawn face. Stocked precut in 5′, 6′ and 8′ lengths.